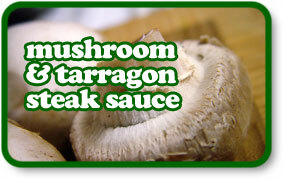 Here we have a simple sauce to serve alongside a steak. I was prompted to share this recipe as I saw someone in front of me at the supermarket with a rancid looking packet that he was paying $8 for. It consisted of a few mushrooms in a bit of cream. I’m sure it tasted as horrible as it looked. There really is no excuse for buying such things! Try this, it’s easy! Heat the oil in a large frying pan over a medium heat. Add the mushrooms and half the spring onions and cook, stirring occasionally for 10 minutes until soft and most of the water from the mushrooms has evaporated. Add the garlic and half the tarragon and stir for one minute. Add the Worcestershire sauce, let it sizzle briefly then add the cream. Let it come to a bubble, reduce the heat and let it simmer for 1-2 minutes to reduce slightly. Season with salt & pepper and stir in the remaining tarragon and spring onions. Squeeze over the lemon juice and serve. Pour over a juicy steak or also great with lamb. We ate it with crispy roast potatoes. If you’re vegetarian, it also works well as a sauce for pasta, like penne.